The NFL's official fantasy football service, offered through NFL.com, will be integrated into Madden NFL 12, updating gamers with scores and results from their leagues, standings, schedules and more. The move, a first for Madden, helps drive interest to the NFL's fantasy offerings, one of the few realms in which it is competing head-to-head for consumers. Some 24 million people are estimated to play in a fantasy football league each year, with services offered on sites like Yahoo! Sports, CBS Sports, and ESPN in addition to NFL.com. To integrate a league, first one must obviously be in a league on NFL.com. The NFL.com Fantasy menu is located under the game's Online menu ("Xbox Live" on the 360 version). The username and password it asks for is to the NFL.com account. Once integrated, fans can see their league scoreboard, standings and transaction wire. 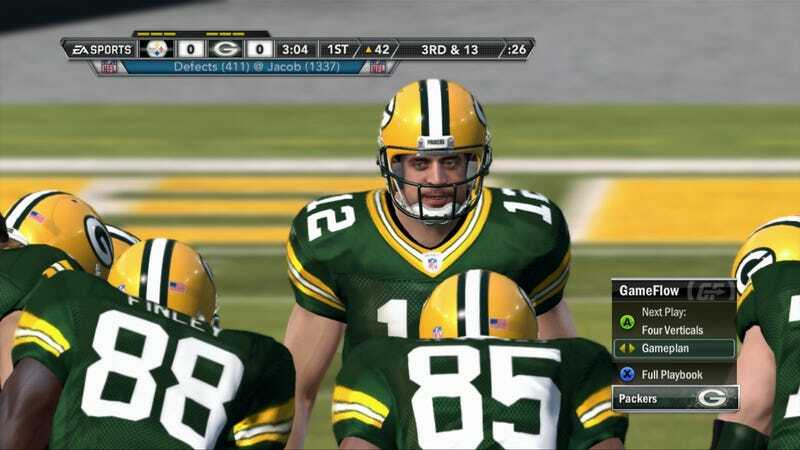 For those who'd rather play Madden NFL 12 on Sunday, live score updates are available in-game. This is an option that can be turned off if you prefer. EA Sports is offering an incentive to link an NFL.com account (or create one if you don't have one yet) by giving out 3,000 Madden Coins. That is the game's virtual currency, which is used in Madden Ultimate Team, or to buy scouting reports of your online opposition. Madden NFL 12 releases Aug. 30.